So, this week I kind of, sort of, fell back in love with Star Wars. 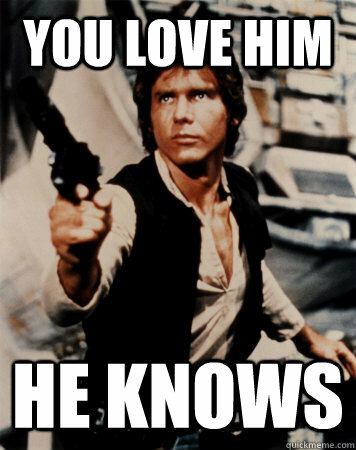 We have a love/hate relationship, Star Wars and I. Essentially, I love it, but then I forget about how much I love it until I watch it again. Then I get kind of obsessed by it. But when that obsession inevitably fades away, I tend to forget about it again. Right now I am in the obsession stage. I watched the Original Trilogy this week for the first time in probably seven or eight years. I don't know how I always manage to forget how awesome it is. It's like having a best friend that you've known since childhood, but you grow up and adult life gets in the way of that friendship and you lose touch and go your separate ways. You make new friends and form new relationships and so on and such forth, but then... when you eventually see each other again, years later, it's like nothing has changed at all. That is the sign of a true friendship, one that can be neglected and forgotten but rekindled in the blink of an eye. And that is the sign of a good film. One that can be forgotten and taken for granted, but is always there, collecting dust on your DVD shelf. Waiting. Ready. Right now I am in love with all things Star Wars. So much so that I am contemplating re-watching the Prequel Trilogy. I haven't seen any of them since they were on at the cinema. I sense that the time has come for me to revisit them. I told you, obsession stage. 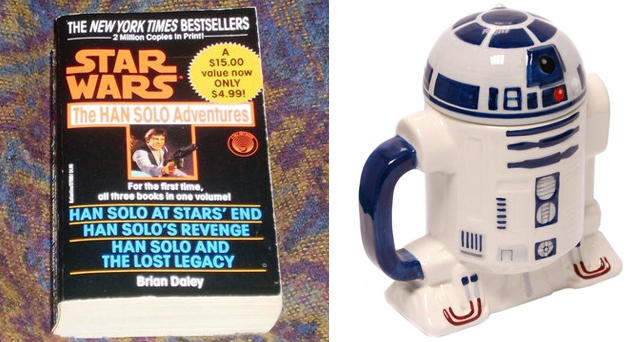 But seriously, who doesn't need a freakin' R2D2 mug with a lid. WITH A LID, PEOPLE! That bad boy will keep my tea toasty and warm whilst I read my Han Solo Adventures novels. Because who watches Star Wars and wishes that they were Han motherfuckin' Solo?!? THIS GUY! 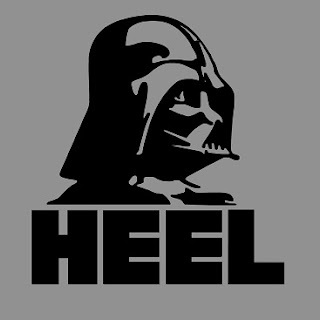 A 'heel' is an insider wrestling term for a bad guy. How cool is that?!?... No? Just me. Okay. You probably have to be a fan of both wrestling AND Star Wars to dig it. This shirt is actually Barber Shop Window's biggest selling shirt ever, so it turns out that a lot of wrestling fans are Star Wars fans, too. Who knew?!? Come pay day, this t-shirt will be mine. May the Force be with you in not forgetting the greatest trilogy of all time! I don't know how I forget about Star Wars, it just kind of happens! I am totally going to take a photograph of me sipping some sweet sweet tea out of R2D2 (when it arrives) and send it to you! Mwahahahaha! I love the Han Solo adventures. ...and the Rouge squadron and I've even read a few of the Clone war era stuff. I think I just wanted his hair and WHuh? That picture is awful. Covet that mug, I do. It really is an awesome mug. Can't wait for it to arrive in ze post! We are the same, except I do this with X-Files. Forgot all about my obsession until May of last year, when I suddenly found myself re-watching the entire series, dropping 200 bucks on the crazy "behind the series" book with prints and film stills and all sorts of goodies inside, and following about 50 people on tumblr that post photos of Mulder and Scully in looooove. If there was a mug with the Cigarette Smoking Man on it, I would have 3 of em by now. A Cigarette Smoking Man mug would be amazing. I really need to watch X-Files all the way through. I have only ever watched it sporadically. Although I don't think my bank balance can handle another obsession right now. Haha. It sounds like it's not so much a love/hate relationship as a love/abandonment relationship. And I have a love/love relationship with Star Wars.